Brainard Carey, co-founder of Praxis Center for Aesthetic Studies and curator at the Museum of Non-Visible Art, recently interviewed Julie Harrison via Skype for Yale University Radio. [blog post] Viva la Revolúcion! / Long Live the Revolution! The impulse for artists in Mexico to reflect on social issues and injustices was recently highlighted after the 2014 disappearance of 43 students from the Ayotzinapa Rural Teachers' College in the state of Guerrero. "Make, Believe: The Maslow Collection and the Moving Image"
Featuring moving image works by: Basma Alsharif, Nazlı Dinçel, Julie Harrison & Neil Zusman, David Haxton and M.M. Serra; with works from The Maslow Collection by: Alice Aycock, Jennifer Bartlett, Mark Cohen, Hamish Fulton, David Haxton, Barbara Kasten, Martin Mull, Ellen Phelan, Robert Rauschenberg, David Reed, Dorothea Rockburne, Sandy Skoglund and Andy Warhol. Make, Believe is curated by Herb Shellenberger (independent curator) and Ryan Ward (Curator, The Maslow Collection). Club 57 Gallery Screening: "Joe Lewis and Friends"
On the occasion of Joe Lewis’ live appearance in the Club 57 galleries on January 25, we revisit performance videos from this musician, artist and co-founder of Fashion Moda. Documentation of an uptown reprise of Club 57’s Lady Wrestling [video by Julie Harrison] is memorable for its ringside interviews and record of audiences engaging with the storefront from the street. Lewis performed regularly with his father, Joseph Lewis Sr, and occasionally with iconoclastic countertenor Julius Eastman. This program samples a gig by Lewis, Eastman, and Lewis at Arleen Schloss’s performance salon A’s and Lewis and Lewis performance videos from media artist Davidson Gigliotti’s series of music tapes. Featuring nearly 100 artists and over 17 hours of video! In the late 1960s, visual artists experimenting with the new medium of video saw the potential of public access television to act as an open and uncensored platform for the creation and dissemination of their work. This exhibition will present both key and lesser-known figures who worked in the Public Access arena, as well as contemporary artists experimenting with the democratic potential of new media platforms on the Internet. The show highlights the historical relationships between community-produced media and political action, documenting the potential for social change and creative reimagining through this technology. B**RIC’s own Brooklyn Free Speech Public Access channels will be continuously aired in the gallery space, and a stage in the center of the gallery will act as a set for the production of new programming by BRIC’s community producers. Historic and recent programming by: Alex Bag, Collaborative Projects, Jaime Davidovich, Tom Kalin, Glenn O’Brien, Nam June Paik, Paper Tiger Television, Raindance, Doug Hall, Chip Lord, Jody Procter, TVTV, Tony Ramos, and Martha Rosler. Contemporary artist projects by: Natalie Bookchin, E.S.P. TV, Ann Hirsch, Jayson Musson, Jon Rubin, Pilot TV, and URe:AD Press | United Republic of the African Diaspora (Shani Peters and Sharita Towne). Exhibition Tours: Offered Wednesday mornings for groups and individuals. The first three months of 2017, I’ll be living in Oaxaca, Mexico, where I’ll be drawing, writing my blog and practicing my Spanish. Should be fun! There have been numerous worker strikes and blockades in Oaxaca City (including deaths), but I’ll also certainly follow the disruptions in El Norte, so keep up the good fight! I’ll send out information about my blog upon first post, probably late January. My work is in the final issue of M/E/A/N/I/N/G: A Journal of Contemporary Art Issues, as the editors, Mira Schor and Susan Bee, celebrate their last 30 years of publishing this magazine by asking "some long-time contributors and some new friends to create images and write about where they place meaning today. As ever, we have encouraged artists and writers to feel free to speak to the concerns that have the most meaning to them right now." It was initially posted of "A Year of Positive Thinking." Click here and scroll down for my submission. Launch party Saturday, December 17, for a magazine that my work is in: Spells, Issue 1: Dreams, published by Irene Lee and Debo Mouloudji. The Emerson, 561 Myrtle Ave, Brooklyn, NY 11205 (closest subway is the G at Classon Ave). 8:30-9:00 Sasha Chang serenades us with a dreamy medley. Stay after for The Emerson's weekly dj set! The New York Times recently listed A Book About Colab (and Related Activities) as one of the top books of the year for art lovers. Check it out and buy it here (just in time for the holidays)! For those new to this website, I was an early member of Collaborative Projects, and my work is in this book! 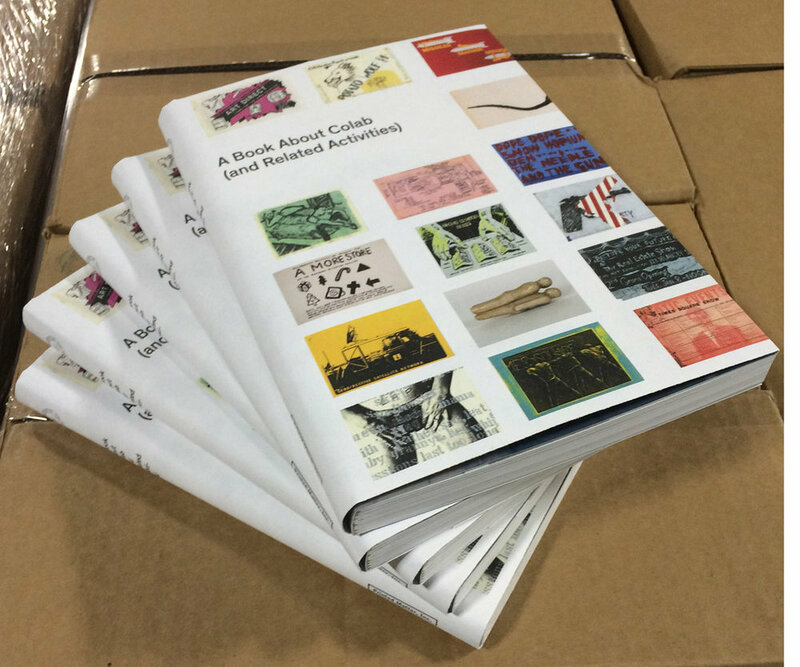 "Books and Museum Treats for Art Lovers," by Roberta Smith, Randy Kennedy, and Ted Loos. The New York Times. The New York Times, 24 Nov. 2016. Web. photo: c. Tom Warren, 1981-1984. The great Lunar Chandelier Press has me designing a book of poems by the talented Vincent Katz, called Southness. Keep your eyes peeled for a release party. I'm also finishing up the design for A Picture of Everyone I Love Passes Through Me, a book of collages by Lynn Behrendt with text mixed by John Bloomberg-Rissman, remixed by Lynn Behrendt. What a lovely collaboration to behold! Volkswagen recommends that you point your key fob at your chin, making your head a kind of organic radio transmitter, in order to boost the signal to unlock your car. You have a spore in your brain: it moves. Pan holds back his cry; instead of “A Day in the Life of a Naropa University Writing Professor” — it is now: “A Day in the Life of a Monster.” Prepare for journeys to the ER; know that your guides will be Miss Piggy and meth and shadows. Highlights: a plate of foaming innards. A life-size silver stencil of Durga sitting on her lion on the side of a boxcar. And, if we dare, the sail will fill and the boat we are in begin to tilt and move. We are all Palestinians now. A solo exhibition of work Wekalet Behna, Alexandria Egypt, hosted by Gudran for Art and Development. The online film festival, MTV: Momentum Technology Videos, features video works of women and transgender artists working with new technologies. The film festival is featured on the Institute for Women and Art website in a video playlist that will run continuously, giving access to viewers 24/7, allowing filmmakers, animators, and other screen artists to present work in a gallery without walls. Julie Harrison presents “Radiated Face” (excerpt from Boundary in collaboration with Neil Zusman). 1980, 02:15 minutes. "Radiated Face" is an excerpt from a longer video, Boundary, that I collaborated on with Neil Zusman in 1980. The work consists of a colorized woman's face combined with sequenced images of female models, a marching band, and a menacing fist while she talks about her lonely childhood and milk contaminated by radiation from a nuclear meltdown. Boundary won the Colorado Award (1st prize) at the Athens Film & Video Festival, an Honorable Mention at the Atlanta Film & Video Festival, a CAPS award as well as toured for three years with Independent Curators International. Please visit the Momentum Directory for links to other artists, arts professionals, and organizations that engage in critical explorations in the field of gender, feminism, art, and technology. photo: JHarrison, still from “Radiated Face” (excerpt from Bounday by JHarrison and Neil Zusman. "The Real Estate Show, What Next: 2014"
Cuchifritos Gallery + Project Space is honored to present The Real Estate Show, What Next: 2014. An extension of The Real Estate Show of 1979/1980, this exhibition will serve as a living project space, presenting new work that continues to question the impending re-development of the Seward Park Urban Redevelopment Area (SPURA) sites. By addressing certain issues that have both united and polarized the neighborhood over the last 30+ years, the exhibition will encourage artists and community members to become an active part of the conversation by focusing on the particular insights and experimental processes that artists bring to imagining new urban spaces. All of the projects, contributed by former Colab members and participants in the original Real Estate Show, take form through audience engagement, as Cuchifritos becomes a flexible site for the active processes unfolding throughout the duration of the exhibition. The Real Estate Show, which opened on December 31, 1979, was an extra-legal occupation of and art show in the city-owned building at 123 Delancey Street on the Lower East Side. Organized by Collaborative Projects (Colab), a collective of artists and activists that formed in 1977 to create exhibition and funding opportunities for artists, the exhibition sought to address the growing real estate crisis in New York City, with the dissolution of lower-income neighborhoods, amassing evictions and displacement of non-wealthy residents. The exhibition, as much art show as it was collective action, was shut down on the morning of January 2, 1980 by The New York City Department of Housing, Preservation and Development, who replaced the once-broken lock and removed all of the artwork, prompting an influential press conference called by the show’s organizers. This public demonstration, attended by the New York Times, Soho Weekly News and, notably, artist Joseph Bueys, led to negotiations between the representative artists and the city resulting in the eventual founding of ABCNoRio at 156 Rivington Street. Collaborative Projects Inc. (Colab), the artists coalition, launched the 1980's by breaking into a vacant city owned building at 123-125 Delancey St. on December 30,1979 and installed the Real Estate Show on New Year’s Eve questioning city policies on housing and development. The police closed the exhibition Jan. 2, 1980. Photo: Julie Harrison, “Guatemala.” 2014, installation view at Cuchifritos Gallery, New York City.